Mention the words “sports bra” to a group of women and you’re likely to see some grimaces. That’s largely because it’s damn near impossible to find one that doesn’t either squeeze too tightly or allow for too much movement. The latter is annoying at best and pretty painful at worst. Thankfully, science has been working on this problem for longer than we would have thought. 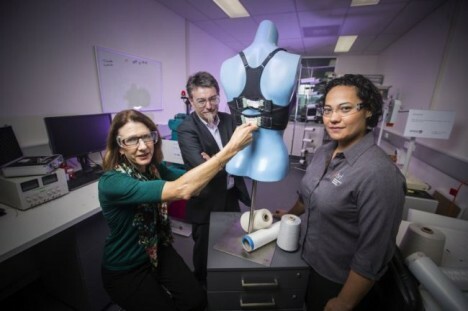 Professors at the University of Wollongong in Australia are working on a “bionic” bra that will adjust its tightness automatically based on the wearer’s movement. According to the researchers working on the project, up to 85 percent of women wearing bras that either do not fit correctly or do not provide adequate support. They envisioned a solution years ago, but technology is just now catching up to their vision of smart yarn that can tighten or loosen in response to movement. Their current work uses new sensing technologies and actuators to “feel” the movement of the breasts and provide proper support. The bra would be looser in response to a resting state and more supportive when activity is detected – say, when the wearer starts jogging. This innovation would mean there’s no need to change bras before and after a workout (a reasonably not-sweaty one, anyway) or to worry about breast pain when running to catch a bus. The researchers say we’re still several years away from being able to buy bionic bras, but they’re confident – and we have to agree – that when it’s finally ready to be sold and worn, it will change bra wearing forever. See more in Home & Personal or under Gadgets. February, 2015.